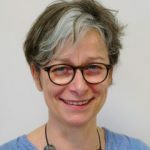 Whether you wish to perform protein expression profiling for biomarker validation, are deciphering a disease physio-pathology, are looking for the right target to study the effect of your compounds or keen to check what its mechanism of action may be, it’s not always easy to decide on the best tool to choose. 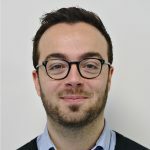 I have selected a few solutions below that may bring some quick answers to these questions, and help you move faster to the next step of your biomarker project: they’re either quick to implement in your own lab or easily outsourced at a reasonable cost in a European partner platform. How broad do you need your exploration to be? What kind of protein family, pathways and biological processes will you be looking at? What type of sample are you studying? Are you limited by the volume of your sample? In this scenario, you do not have any idea at all of what you are looking for. You will want to have access to the broadest profiling options available. 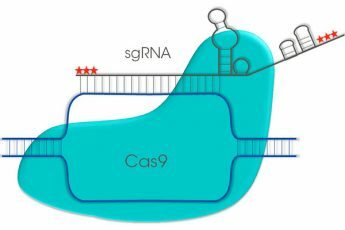 The type of proteins you will be looking at will drive the choice of tool: are you looking at secreted or signalling proteins? I have identified 2 antibody array solutions for this, either Biotin labelled based, or with a sandwich antibody-pair option. The number of samples and their volume are important factors to drive your choice. 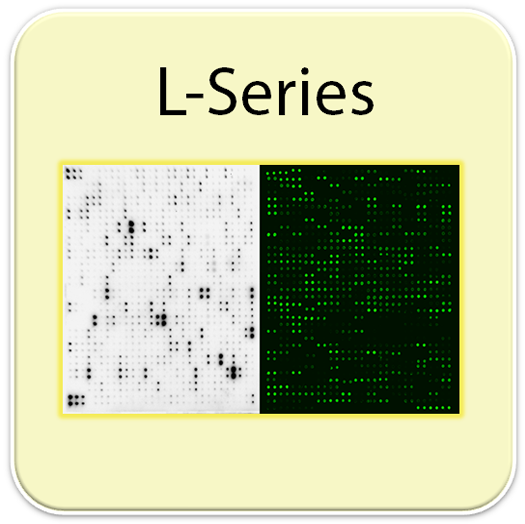 The L-Series format I introduced in a previous post is perfectly suited to this kind of studies, with a possible number of marker as high as 2000 for human samples, 500 for mouse and 90 for rat and a sample volume smaller than 100ul plasma or serum for the whole experiment. 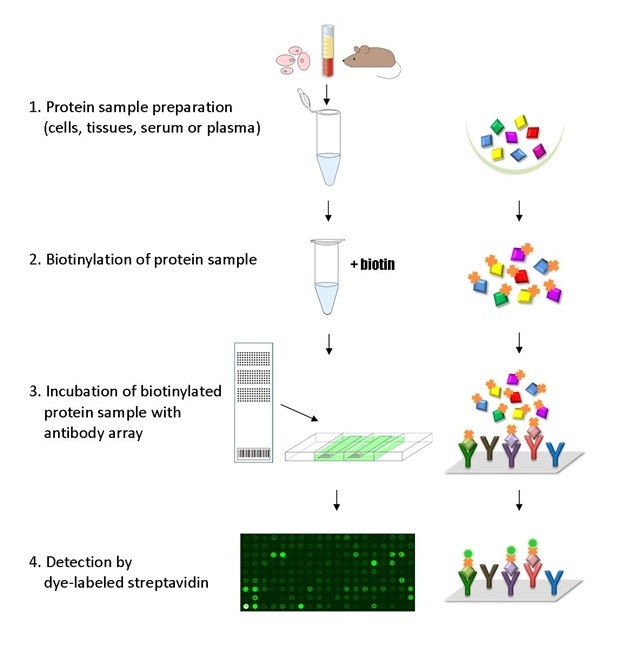 This Biotin Label-based Antibody Array Series generate a broad, panoramic view of protein expression including cytokines, chemokines, adipokines, growth factors, proteases, soluble receptors, adhesion molecules, and other proteins, making this format ideally suited for biomarker discovery studies and exploratory screens. 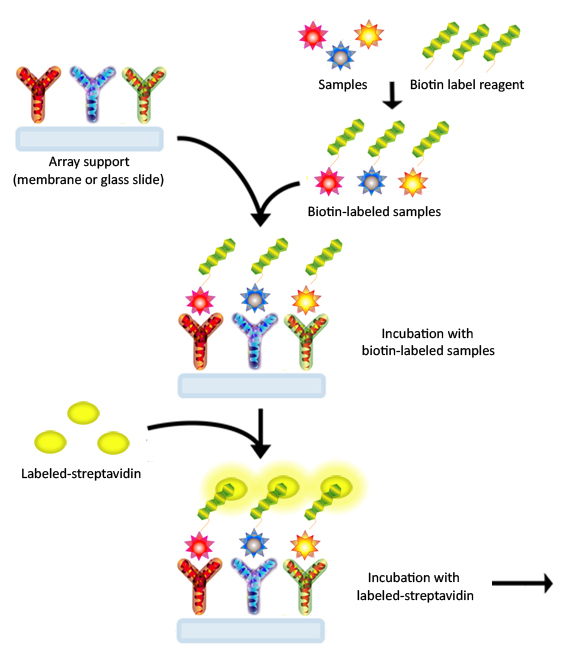 Through a simple labeling process, the sample proteins are directly conjugated to biotin, eliminating the need for a second antibody to develop the array signals. In this format, unintended antibody interactions are impossible, thus eliminating limitations on the size of the array panel. 2 formats are available. 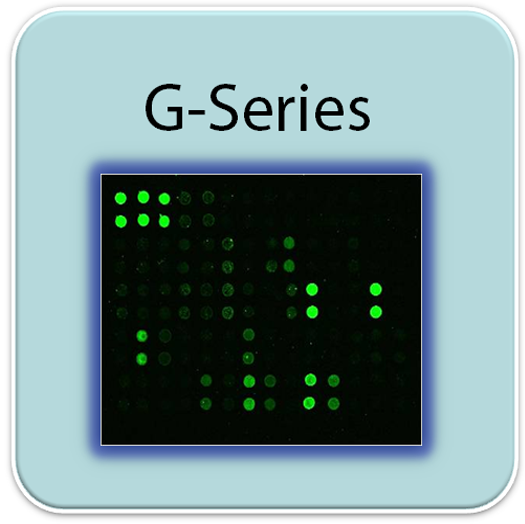 If we take the example of the human arrays: membrane format for a chemiluminescence detection convenient for use in any lab, glass slide format with a fluorescence detection requiring a laser scanner, that you can outsource to a certified lab. All come with a dedicated software to simplify further data analysis. As few as 2 samples can be processed with this format, making it a very cost effective option for a one shot broad profiling. Specific care should be taken for sample supernatants: low levels of serum in the culture media should be used to avoid cross-reactivity hence high background. Same for sera which should not show traces of hemolysis. 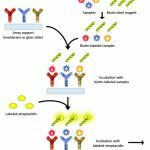 If sample volume is not limited, the sandwich based antibody array technology, High density G-Series format, will bring more specificity to your experiment and will be suitable for a broader range of samples. eg. 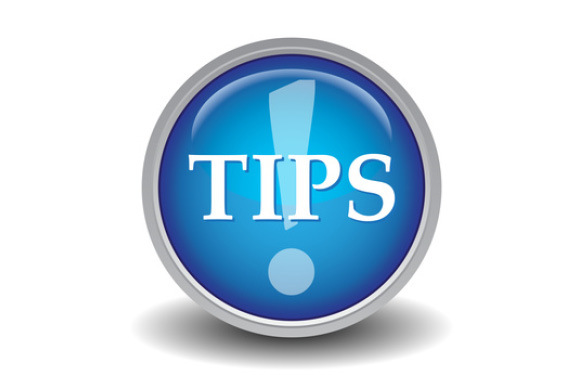 the % of serum in your cell supernatant is not limited. 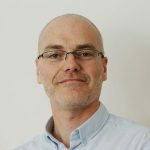 There is no biotinylation of the samples, hence lower risk of background or normalisation bias. Again up to 1000 human targets are available to analyze in one single experiment, 200 for mouse and 67 for rat, with target lists significantly different from the L-Series. 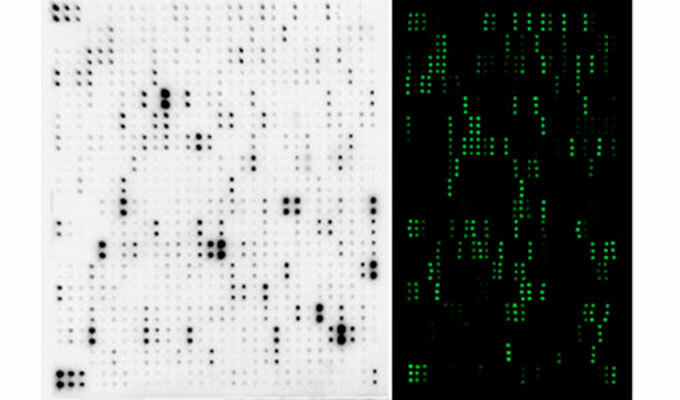 The sandwich pair, as opposed to the biotinylation of the sample in the L-series, provides a more specific signal, on a glass slide format with fluorescence detection. Outsourcing to a certified laboratory is highly recommended. Multiple of 16 samples are the most cost-effective option. As these arrays can accomodate 40 analytes, a combination of array is required to reach the 1000 targets, hence the higher volume of sample required (eg. around 2.5ml of plasma or serum for human samples). 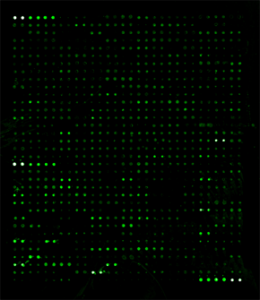 To cover most phosphorylation pathways in one single experiment, a very convenient antibody array allows you to do this in one go: the phospho explorer antibody array PEX100. This glass-based antibody array is most suited for broad-scope protein phosphorylation profiling and screening in cell and tissue samples from human, mouse and rat. It consists of 1318 antibodies related to multiple signaling pathways and biological processes. 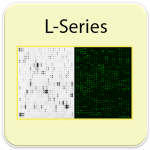 Each package contains two identical array slides for analyzing two samples, such as a control sample and a treatment sample. You may wish to benefit from the expertise of certified laboratories for this. 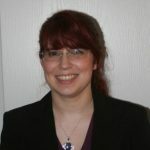 They may help you in your data analysis. The data generated will show you profiling ratio between phosphorylated proteins versus total proteins, as well as phosphorylation levels variations from one sample to the other. 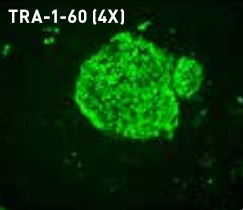 The Cell Signaling Antibody Array SET100 is a high-throughput antibody array for qualitative/semi-quantitative protein expression profiling. 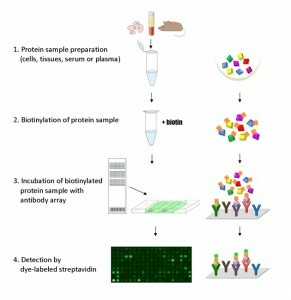 The array is designed for broad screening of protein level changes in multiple cellular signaling pathways, comparing normal samples to treated or diseased samples, and identifying candidate biomarkers. 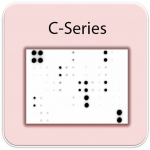 Two formats are available as catalogue items for a variety of protein family, pathways, syndromes… such as angiogenesis / cancer biomarkers / Inflammation /Obesity /Neurosciences arrays, Cytokines / Chemokines / Stem cells / MMPs arrays…. 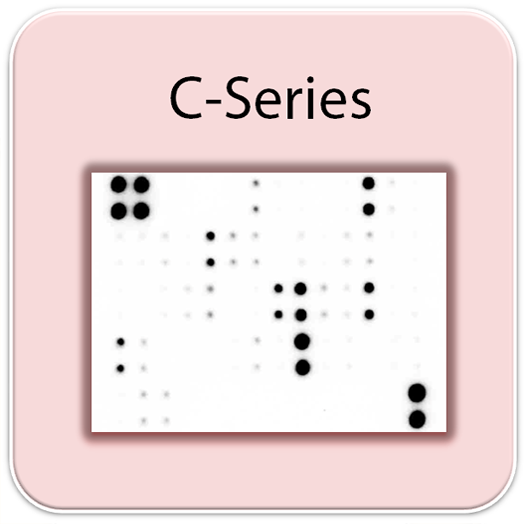 Both C-Series and G-Series are sandwich based antibody array. 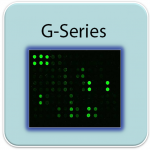 Membrane-based C-series with chemiluminescence detection, a nice format to avoid multiple western blot analysis, saving time and money. 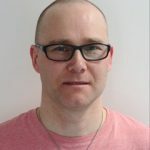 Choosing from all these options may be a bit daunting… you can contact me via the comments section below this post if you’d like some advice on the best one to choose, and the most suited to your project. I’ll be happy to help!